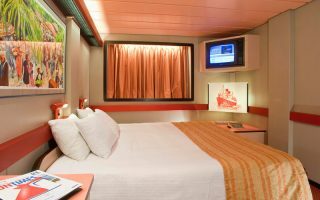 The Interior staterooms have two lower beds, which can be converted into a king size bed, flat-screen TV, and a private bathroom with a shower. 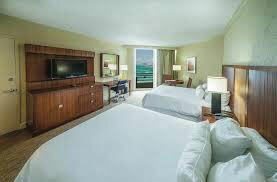 Room includes chair and coffee table and 24-hour Stateroom service. 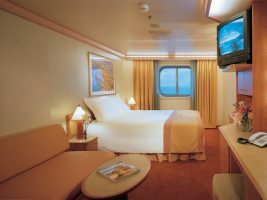 The Ocean View staterooms have two lower twin beds that can be converted into a king size bed, one upper and a sofa bed, flat-screen TV, and a private bathroom with a shower. Room includes sofa and coffee table and 24-hour Stateroom service. 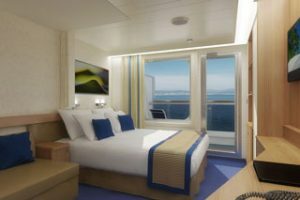 The balcony staterooms have two lower beds that can be converted into a king size bed and a door that opens to private balcony, flat-screen TV, and private bathroom. The ocean suites have a private balcony, two lower beds, which could be converted into a king size bed, flat-screen TV, private luxury bath and shower. The grand suites have a private balcony, sitting area, bedroom with king size bed, flat-screen TV, and private luxury bath and shower. The suite also has a double convertible sofa bed to accommodate third and fourth guests. WORLDVIEW VACATIONS/W-HOTS retains the right to use all passenger’s images and/or likeness in connection with any still photograph, live or recorded video display or other transmission or reproduction of the event, in whole or in part. These images may be used for advertising, websites, videos and promotion. Copyright © 2019 What Happens on the Ship. Web Design by RJSmith Creative.